Home Health & Wellness Tooth Talk Do You Want a Whiter and Brighter Smile? When brushing twice a day and flossing doesn’t help improve your yellow stained teeth, it’s time to consider other options. White teeth help to radiate your appearance, your confidence, and it enhances your smile. Whitening your teeth is an inexpensive cosmetic remedy available to enhance a dull smile. Whitening works well if you have teeth that have darkened from age, coffee, tea, smoking, or medications. I would recommend you to have a dental exam done first before using any over the counter products and your dentist can help you to choose the most effective whitening method for you. • In Office Whitening is performed by your dentist and it whitens your teeth faster. The whitening solution used is usually much stronger than what you can buy over the counter. When you leave your dentist office, your teeth will be whiter and in some cases can be 5 shades whiter. • Take Home Whitening is where your dentist will make your custom trays to fit your mouth and will send you home with a syringe of the whitening gel. They will show you how to use it and the length of time it should be used. You will see results but it will take up to 5 days depending on the beginning shade of your teeth. • There are several Over the Counter whitening products you can buy at most stores to include: Whitening Toothpaste, Whitening Strips, and Brush on Whitening gel. Whether you choose In Office, Take Home, or Over the Counter Whitening in order to maintain your whiter and brighter smile you may have to change some of your habits. 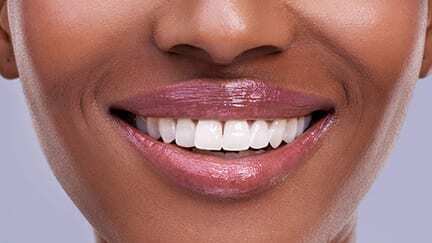 When using any of the whitening products, if you notice your teeth have become sensitive, call your dentist to inform them of the problems you are having. I hope this Tooth Talk has helped you to know how you too can have Whiter and Brighter teeth and improve your smile.